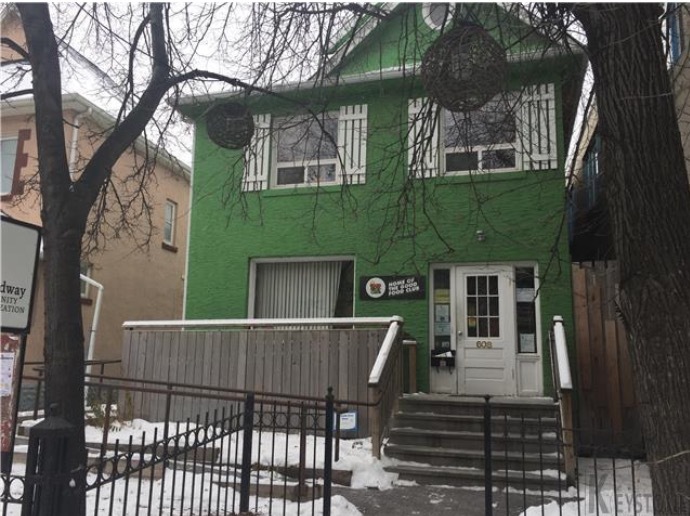 Professional office space is available for rent in a homey, accessible building in the vibrant West Broadway neighbourhood. Located between Wolseley and Downtown, West Broadway is a trendy commercial neighbourhood where you’ll find some of Winnipeg’s best independently-owned food, entertainment, fashion, and personal and professional services. It is also rich in culture, diversity, and community spirit, with its community gardens, free drop in art programs, street festivals, and other community offerings. The building at 608 Broadway was a charming residence when it was built in 1900. It has retained its comfortable character since its conversion to commercial use, and is soon to be home to a busy private psychology practice. The building is adjacent other personal and professional services, including medical, legal, and financial. It is close to downtown and the University of Winnipeg, and is on several city bus routes. Designated parking is also available, at additional cost. This is an ideal opportunity for mental health care providers, or other professional service providers, who are seeking to rent a comfortable character space, with administrative support, that will permit more time and attention to be devoted to service provision. Viewings are possible after January 15th, 2018, with tenancies scheduled to begin February 1st, 2018. Queries should be directed to Dr. Michael Ellery, C.Psych., at 204-509-7412 or DrMichaelEllery@gmail.com. Thanks to everyone for your interest! MPS will be offering a free media training workshop to all members, facilitated by Judith Cameron. The workshop will focus on navigating the interview (strategies for interview success within a variety of modalities), communicating with media in crisis situations, and more.The workshop is tentatively scheduled for Monday February 5th from 5-8pm.Please send an email to Dr. Kristin Reynolds (kristin.reynolds@umanitoba.ca) if you are interested in attending the workshop. Want an opportunity for learning, fun, camaraderie, and great food? The MPS Annual General Meeting and Conference is being planned for Monday, March 19, 2018. Continuing education presentations will be held in the afternoon, followed by dinner and the Annual General Meeting (keynote speaker to be determined). Student Poster Competition – we will be holding our bi-annual Student Poster Competition at the MPS AGM on March 19, 2018. Interested students should submit the title of their poster to Maia Kredentser by February 19, 2018 (posters presented at other conferences may be used). The winner will receive a cash prize and recognition at the AGM. More details will be sent to presenters closer to the date. February is Psychology Month! Information about events will be forthcoming through email and on our Facebook page. As Manitoba Psychological Society does not have an office, records from 50 years have been stored in boxes and files in the homes of various MPS officers, past and present. Thanks to receipt of an APA Organizational Grant, MPS can fund a project to digitize most of our records, which will make access easier for administration and clear some basement and home office space! We are fortunate to have our student representative, Maia Kredentser, organizing assistance with this project and we also will be using a professional service. If there are any more MPS records lurking in basements somewhere in the city, please do contact Maia at umkreden@myumanitoba.ca or our Executive Director, Dr. Teresa Sztaba at executived@mps.ca and we will gladly retrieve them for this new posterity project. What are your initiatives with the board? I eagerly joined the MPS Board in the fall of 2016. One of my main roles within the board is Communications Director. This involves preparing press releases, connecting media with clinical psychologists who have particular areas of expertise, and organizing media-related events such as the upcoming media training workshop (mark your calendars for Monday February 5th 5-8pm and see details above)! I am also a member of the Mental Health and Addictions Advocacy Committee within the MPS Board. This newly-formed committee is in the process of bringing together a network of community agencies and professional associations who are involved in the advocacy of mental health and addictions services and treatment, in order to coordinate advocacy efforts. What do you enjoy about being on the board? I am passionate about clinical psychology and the advancement of science and practice. Being on the MPS Board provides ample opportunities to become involved in initiatives that help to shape the future of psychology in our great province. MPS initiatives include those focused on mobilizing advocacy efforts, transferring psychological knowledge to the public, and collaborating with psychologists and organizations completing important work in the area of mental health. As a new investigator and early career professional, being on the MPS Board has also been a wonderful way to meet clinical psychologists who work in a range of professional settings.